Responsive, courteous customer service is the lifeblood of our business. At File 4 Me, we just don’t say our customers are first, our actions will prove it to you. 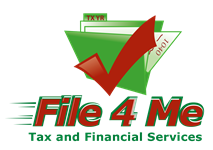 File 4 Me is your solution for federal and state income tax preparation services and prior year tax issues. We offer fast, affordable income tax preparation to accommodate your busy schedule. Our promise is to not only prepare and file your taxes but to walk you step-by-step through the process. Our goal is to help you understand how the tax code impacts your take home pay, before and after April 15th. We know that preparing your own federal income tax return can be a confusing, time-consuming and a complicated process. While the “Tax Box” may seem easy, it does not offer definitive answers to your specific situation. Let File 4 Me answer your questions and correctly prepare your taxes according to IRS guidelines. If you have not filed your Federal or State taxes in years, need to establish an Installment Agreement or received a garnishment letter from the IRS, we can help. Our trained staff of IRS Enrolled agents will fight for you. Don't close your eyes and hope the issue will go away. We have solutions and answers to help. We offer full representation services to help you get relief from the Internal Revenue Service.